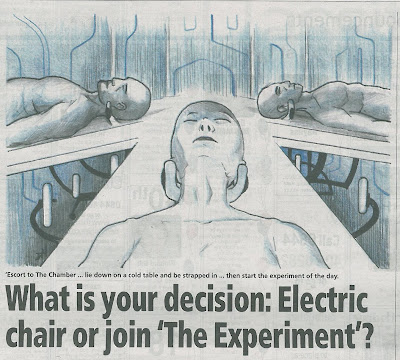 So my short story 'The Experiment' made its debut this past Saturday in The Derby Telegraph. This is exciting and you can read 'The Experiment' online at the This Is Derbyshire website. 'The Experiment' is really an experiment on several fronts: I'm writing science fiction, and there is an experiment in the story. I have plans to expand upon the much abridged version now published in The Derby Telegraph. Many kudos to author Neal James for connecting me to The Derby Telegraph, Steve Hall and Jane McFarlane at The Derby Telegraph, and also especially to David Hitchcock for his original artwork for the story. Again, you can read here. AUTHOR NOTE. This is most likely the prologue to the second book of a series of crime novels following an investigative journalist, Jack Rawls, and an orphaned teenager he befriends and later adopts named Angel. This project is pretty far off, but will be loads of fun to write. Hope you like this sneak peak.